Moving is stressful for everyone, even when it’s positive change. For kids, it can be even more stressful because it’s rarely their idea, and they often feel powerless. I’ve got 12 tips to prepare kids to move that can help minimize that stress. You may not need all of them, but they will stock your toolbox. Because I specialize in gifted youth, I’ll be sharing some specific tips for how to help prepare them for a move. I’m using the word “kids,” but these 12 tips to prepare kids to move work for teens and adults as well. Leaving a house is a loss. We often anthropomorphize our homes (ours even has a name!). Leaving the house, in addition to leaving friends, a church family, one’s school, and even familiar stores and parks, can feel like a death. Understand that kids are grieving, and let them make their way through the stages of grief without constantly trying to force them to be cheerful about it honors that grief. The work of Elisabeth Kubler-Ross and David Kessler on grief is well-known. Sharing with your child the stages of grief can be helpful. Even having a list of them on the fridge can help kids gauge and name what they’re feeling. Denial – The first stage in grief is denial. You may be surprised to hear your child talk and act as if the move is not really happening. Don’t worry: they’re not losing their minds. It’s part of how the mind protects itself. They’ll move into the next stage soon enough, so don’t rush this one. Anger – When the anger stage hits, you may wish you had denial back. The anger may seem to be misplaced – they may become mad at the very people they love the most, including you. In grief, we find strength in anger, so try not to take it personally. That doesn’t mean that you need to allow all behavior in the name of grief, so be clear with child about appropriate expressions of anger. Making sure kids are getting adequate physical exercise can help with the energy anger creates. Bargaining – If your child is old enough, you will definitely get this: “What if I live with so-and-so? You move. I’ll stay here.” And for some people, that may work, but not if your child is, you know, ten. It’s tempting to roll your eyes and give a firm, no-nonsense, “We’re moving. You’re coming. End of discussion.” Remembering that bargaining is a grief stage can help you keep the mental energy needed to listen to even elaborate schemes to try to avoid the move. Depression – It’s tricky that this stage comes near the end because the parents may have run out of emotional energy by now, and it can seem like going backwards. The same child who was full of energetic anger and lively bargaining discussions is now a lethargic, apathetic puddle of tears and sullen darkness. Realizing that depression is the bridge to acceptance can make it easier to handle. Acceptance – Acceptance and happiness are not the same, so this doesn’t mean sunshine and smiles. It means a slow transition from pure grief to less consistent grief to some good days to more and more good days. It’s a recognition that you have a new life, past the trauma. 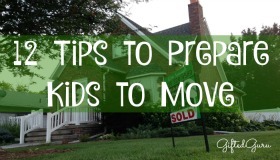 As soon as you know you are considering a move, let the kids know. Some people worry that this will unnecessarily distress them. This danger is less than the danger of a child’s not feeling included in decision making and powerless. Sharing the reasons and process for the decision can build children’s own ability to make difficult decisions, learning how to evaluate the pros and cons. Once the decision is made, prepare them for the moving process with a printed timeline of when the current house will be put up for sale (if that’s happening), when you will visit the new location, when you will pack, where you will stay during transition, when they will start new schools, and any other information you can add. Be honest. Kids handle honesty better than they handle subterfuge, and they see protective selective information sharing as lying, especially GT kiddos. Unless you have a compelling reason not to share details ahead of time (perhaps job confidentiality), let them know the why’s and wherefore’s. 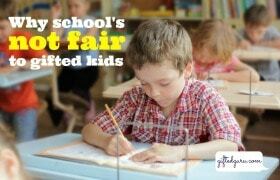 Because kids feel powerless in this situation, let them make as many choices as possible. Can they choose which toys to keep out while the house is being shown? Can they choose their bedroom? Its paint color? Can they choose a name for the new house? Can they participate in the interviews of realtors? If money is an issue, be clear. I was raised poor, and kids who are poor know they’re poor. There is nothing to be gained by pretending everything is fine if the finances are in distress. There is no need to wait until crisis until you seek intervention. A session or two with a counselor during the process of the move can be a great preventative measure, and can also make it easier for kids to be open to seeing a counselor if there are issues after the move that could benefit from professional help. Lead by example. Be overt and explicit about how you are planning to adjust to the move (not in a preachy way). Share the ways you plan to make new friends. Share how you are joining new groups. Share your own conflicting feelings. Blooming where you’re planted doesn’t mean there aren’t weeds growing near you sometimes! Don’t wait until the move to make connections. You may not know the school yet, but you may be able to get tapped in to other types of things similar to the ones in your current location like Scouts, martial arts, music lessons, religious communities, children’s museums, dance classes, etc. Social media can be a great way to find other like-minded parents. Share on a group you belong to that you’re moving to an area and ask if anyone knows anyone there. Search on the net for top things to do for families in the area, and let your children help choose which ones they’d like to visit. See if any of the places offer virtual field trips. For example, many zoos have zoocams on which you can watch the animals. Luring kids to a new area with positive anticipation is a wonderful way to create organic, authentic excitement. It’s important to help kids create memories they can take with them to the new location. Pictures and videos can help. Make a list of the top ten things you have loved about living where you do. Make a photo album of your favorite places, in and out of your home. It can also be a great idea to leave a video for next family about all the wonders and secrets of your home and neighborhood. There are some great books about moving written for young readers, both fiction and non-fiction. Stirthewonder has a list for preschoolers and toddlers. Greatschools has a list that includes books for readers through 3rd grade. Goodreads has a list as well, and these are nice because they have reader ratings. I love Booknixie’s list of award-winning children’s fiction about moving, including many I’ve read and loved. No one knows moving and its impact on families like the military, and they share lots of great resources. I’d start here. Journaling is great way to help kids record their feelings, both positive and negative. Christy Peterson wrote a great article about the benefits of journaling for kids. Journals should be allowed to be private (no peeking!). If children are too young to write, dictate for them. You don’t need anything fancy. Just grab a spiral or composition book and start writing! Let kids decorate a cover image with a picture they take or draw of the home. One of the most wonderful things about today’s digital age is the way it can help us stay in touch with faraway friends. Skype, Google hangouts, text messaging, and phone calls all combine to make it possible to maintain friendships across the miles. Setting appointments for communication in advance can help kids feel more in control and less anxious. We’ve hosted foreign exchange students in the past, and the guidance we’ve received has been to limit contact with home to an hour a week. We found that be good advice that allows kids to stay connected with old friends without being so connected with the old that they feel like it’s a betrayal to make new friends or are getting too much of their socialization with old friends. Often kids love organizing projects, and letting them search for moving organization tips can be a great way to channel their energy related to the move. Kind of like cooking with vegetables they’ve grown, being a part of the actual organizing of the move can make the whole thing more palatable. Some kids may like to create a Pinterest board for you or a notebook with ideas. Take their ideas seriously and incorporate as many as you can. This isn’t a hardship, as they will likely find good ideas! A decision must be made about whether the kids should be there when the moving trucks (or helpers) arrive. There’s no one right answer. It’s something like watching sausage made, so it can be incredibly anxiety producing. It can also be helpful to see the house empty and realize that the house is a shell and you’re taking your home with you. For younger children especially, there must be a plan. They need not to be made to feel underfoot and in the way. An off-site babysitter may be the best choice, with frequent progress check-ins (including photos!) for children old enough for that. Plan what the kids will do if they do stay. Can they man a checklist? Help clean? 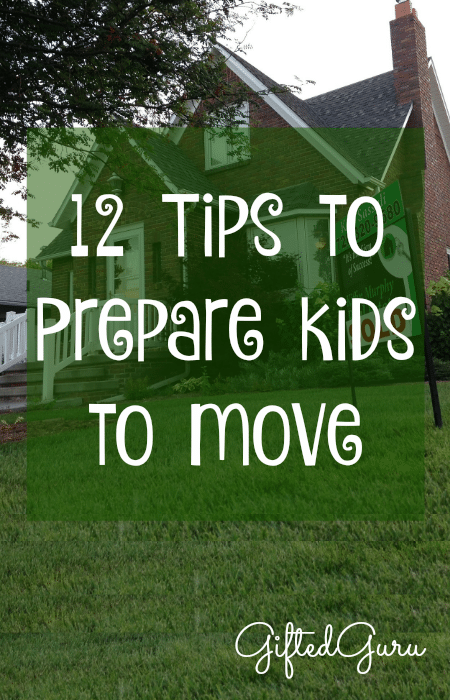 I hope you find these 12 tips to prepare kids to move helpful. If you’re going through a move, be sure to take time for yourself, too. You will have the same challenges as your children in many ways, so be patient with yourself. And best wishes to you in your new home! North American Van Lines shared this infographic with me to share here about families on the move. It’s not sponsored or anything, just great info in picto-form! My children and I are moving to a new state in two weeks. I just got a new job and so the move is really unexpected. My kids are really anxious about moving, but I think that if I keep them involved in the process as much as possible that they will be better off. I really like the idea about getting them to help with organizing everything. I think that that would be a help to both me and the movers that will be helping us out soon. Thank you so much for writing. I hope you have a great move, and that the tips help you. Lovely post! Our last move was when our daughter was two and it was quite easy , plus we didn’t have too much stuff then. But now she’s ten and her sister is six and both of them have too many friends here. We are moving because of my husband’s new job and it’s going to be a big adventure. I hope that the girls will do fine with all this, but I have my worries of course. I already promised that they will be able to choose their rooms first ( the house we are moving in is bigger than our previous one) and to choose the paint color, the decorations for their room and some new furniture too. Your post is quite helpful and gave me some more good ideas. So glad I found it. Thanks for the nice information! Oh, that’s so kind of you to write! Best wishes in your new home! This is some great information, and I appreciate your suggestion to plan moving day to be the best for your kids. My husband and I have three children, and we’re going to be moving in about a month. Most of them are excited, but it will still be hard for them, so I’ll definitely arrange to have them spend some time with friends or family while the movers take care of packing everything. Thanks for the great post! Thank you! I hope your move goes smoothly! These are really great tips! I have two kids and they had really difficult times getting used to the thought that we are moving away forever. We have recently moved from the town we use to live in and now we are in London. Thank you for the tips! I’m so envious! I love London more than any city in the world! Wonderful Post! All tips are great which really help kids to be mentally and physically ready even before the day set for moving. Off to share this post! Thanks so much for the nice feedback, Christy! All your tips are great! This are extremely helpful! Moving is hard and it is more difficult when you have kids. Every bit of help should be appreciated and will surely share this post to my friends. Thanks you. Good stuff! We’ve found that keeping the kiddos involved helps. Give them small jobs that are fun to keep them active. You are right moving is very stressful work. Moving with kids are very difficult. First of all the how to telling the kids for move. But i am read your blog and i get the some good ideas for preparing kids to move. Thanks for sharing the great information. Good Luck! Tip number 3 is the most important one to me. Getting your kids involved in the move creates a positive atmosphere and you are much less likely to have any emotional incidents on your big move day. Thank you very much for sharing this nice post.Help them get involved in their new school and community. I really appreciate your reminder of how depression is a bridge to acceptance when it comes to hard moves. My wife and I might have to move into a different city from my new job, and our daughter already made a lot of friends here. I will be sure to tell my wife that if our daughter gets depressed, that is a natural step! Actually, you share the information is very helpful because moving with kids is very troublesome. You share the tips is really nice and useful. Great!